California’s new accountability system provides California Schools and Districts with a Dashboard report that displays school performance in the five Local Control Accountability Plan (LCAP) priority areas. These performance areas will be measured using a combination of state and local indicators for: English Language Arts (ELA), Math, English Learner Progress, Suspension Rates and District Graduation Rate. Congratulations to Glenview School on a 16% increase in overall Student Achievement in both Language Arts and Math in 2016. Based on continued growth and achievement in 2018, the new CA School Dashboard indicates Glenview Elementary scored above (yellow range) the State of California in Math, Absenteeism and Suspension Rates, with our school-wide PBIS program (Positive Behavior Interventions & Supports). 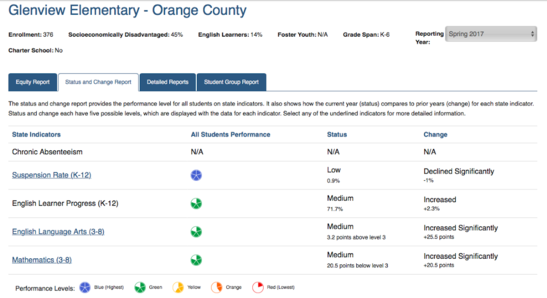 Glenview scored equal to the state's average performance (orange range) in Language Arts. Glenview School has also been recognized as a STAR School by CA Honor Roll, as part of a national effort to identify higher-performing schools, particularly higher poverty schools that are closing the achievement gap. Glenview School is proud to highlight successful practices that improve outcomes for students and receive this honor and distinction for improvement in achievement and reduction in achievement gaps among student populations.